The Islamic heritage of the Americas is largely ignored. Besides some speculation about pre-Columbus Muslim explorers, the odd discussion on African slaves and infrequent write-ups concerning recent Muslim migrants, the topic remains at best ill explored. 1. Did a black Muslim king come to the Americas before Columbus? It’s now widely accepted that Christopher Columbus was not the first ‘Old World’ traveller to stumble upon the Americas, and several theories suggest he may have been preceded by Muslims. The most fascinating is the story of Abubakari II, the mediaeval Sultan of the wealthy Mali Empire, who may have landed at Pernambuco – modern day Recife in Brazil – around the year 1312. 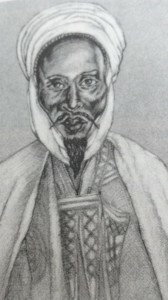 Abubakari II’s gold-rich empire was the wealthiest in its day, and he was influenced by Muslim scholars like Al-Idrisi, Istakhri, Abu Zaid, Masudi and Albufeda, whose books – all in his libraries – claimed the world was round like the “gourd of a bottle”. The legend goes that in 1310, Abubakari II sent a fleet of 400 out into the Atlantic seeking what might lie across the way. Several months passed before one lone captain returns to tell him that he had turned back after seeing the other boats dragged into strange ‘rivers’ with strong currents flowing within the sea – equatorial currents (one of which flows from west Africa to the tip of Brazil where Recife is). Undeterred, Abubakari II immediately begins planning the next expedition, with an even bigger fleet (some estimate around 2,000 boats). Most astonishingly, this time he was going too! Sure enough, in 1312 he handed the richest throne in the world over to his brother Kankan Musa before setting out across the Atlantic and into those ‘rivers’ within the sea … never to be seen again. No reports of what happened to Abubakari II have ever been found, but some academics and researchers believe he made it to Pernambuco. One theory claims the name itself is a deviation of the ancient Mande word ‘Boure Bambouk’, which means ‘rich gold fields’ – the source of the Mali empire’s wealth. Columbus himself reportedly came across Muslims and ‘black’ traders along the New World coastline and most interestingly, returned with gold that had the exact alloy mixture of Malian gold. 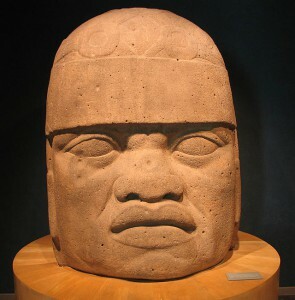 Those who believe the legend also point to linguistic, archaeological and physical evidence, most notably the discovery of giant stone sculptures strewn across Latin America which have unmistakeably West-African features. 2. 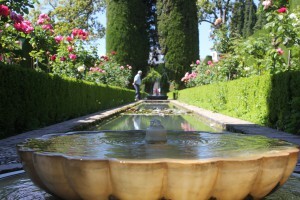 Spain’s Alhambra was ‘discovered’ by a New Yorker! 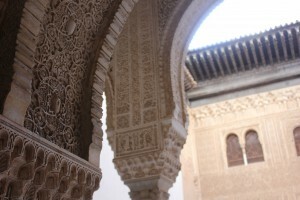 Most people agree that the finest example of European Muslim artistry is the Alhambra in Spain. The ‘red fortress-palace’ is also where the Catholic monarchs, Ferdinand and Isabella, completed their conquest of Spain in 1492. Irving’s book went on to be a best-seller and shortly afterwards in 1870, Spain declared the Alhambra, a national monument. Today it is one of the most visited tourist sites in the world. The Alhambra ‘fell’ in 1492, and the day it did, in the town below, amongst the watching crowds was an ambitious explorer called Christopher Columbus. A few weeks later, he was in Cordoba meeting the Catholic monarchs to get royal approval for setting sail across the Atlantic. Dr Irving cites the Muslim influence on the names of early cities and towns such as Recife in Brazil (from the arabic ar-Rasif to mean ‘dock’ or ‘wharf’) and Guadalajara in Mexico (from ‘Wadi al-Hijara’ or ‘Stony River’). 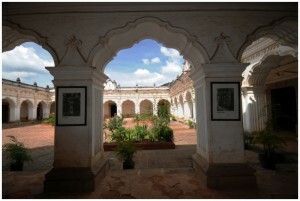 He also points to the style of early civic buildings in cities like Queretaro (Mexico), Popayan and Tunja (Colombia) and Quito (Ecuador), where the inner patios and courtyards have arabesque-style arcades and resemble those in the Alhambra and other Moorish buildings. 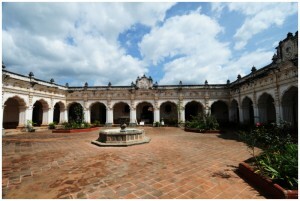 The Cloister of “La Merced” in Lima, Peru and the Cloister of the University of San Carlos in Antigua, Guatemala for example. Dr Irving also highlights the obvious Moorish geometry found on older ceilings from the 17th century in towns like Mexico’s Tzintzuntzan and Colombia’s Tunja. Firstly, yes, there is such a thing as an ‘Indigenous’ European Muslim. 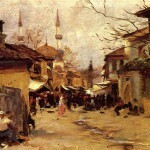 The Tatar Muslims from the Baltic region of Europe have a history that goes back 618 years. Their story begins in 1398, when they are brought from the Crimea by the Grand Duke of Lithuania, Vytautas the Great, to help defend his empire against intolerant Christians – the Teutonic Knights. Vytautas rewards the Tatars for this help by letting them settle permanently under his protection in an area that now falls in parts of Lithuania, Poland and Belarus. Some of the descendants of that Baltic Tatar community made their way to America and into Brooklyn, New York City, at the turn of the 20th century. 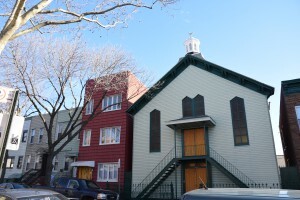 There in 1931 they purchased an unassuming little church and opened it as a mosque. 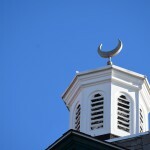 Today, The Brooklyn Moslem Mosque is the oldest surviving mosque in North America and remains in the care of Tatar Muslims who can trace their ancestry all the way back to that ancient European Muslim community. For those of you still wondering if it is a myth. It isn’t. American founding father, Thomas Jefferson, did indeed have his own personal translation of the Qur’an. 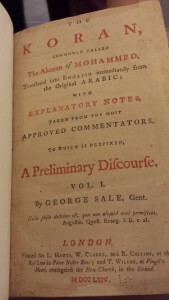 This early translation of Islam’s holiest book – possibly the first to come to America – is now kept on the shelves of the ‘Jefferson Library’, inside the Library of Congress in Washington DC. This is where Jefferson personally sent his library, offering to also “arrange and number all the books as they stand in the catalogue”. His Koran, he shelved in the legal section. For America’s third President (also the man who drafted the Declaration of Independence), it was the Qur’an’s legal positions that fascinated him the most. 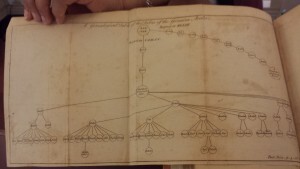 This is why some analysts claim the ‘Koran’ Jefferson ordered from London around 1764 affected his views on religious tolerance ahead of drafting the Bill for Religious Freedom (enacted 1786). ‘Jefferson’s Koran’ is the earliest and clearest physical evidence we still have of Islamic culture interacting with the Americas. 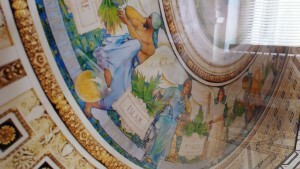 However, if you find yourself in the Library of Congress, do take the time to stop and admire it’s great Renaissance style dome, high above the beautiful reading room. Look carefully and you will see further clues that hint at the role of Islam in the development of the United States of America. Tharik is a freelance journalist, travel writer, photographer and broadcaster specialising in the Islamic stories of Europe and the West, and Muslim ('Halal') travel.